By using a Dynamics 365 connector, you can create flows that initiate when an event occurs in Dynamics 365, or some other service, which then performs an action in Dynamics 365, or some other service. 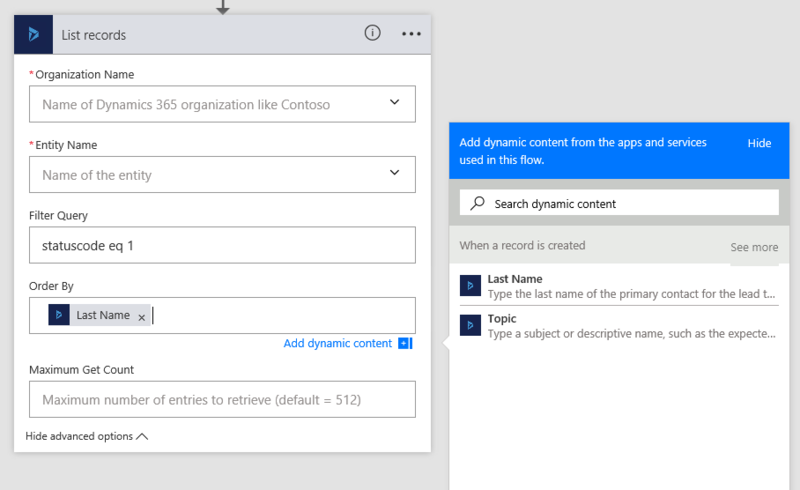 In Microsoft Flow, you can set up automated workflows between your favorite apps and services to synchronize files, get notifications, collect data, and more. For more information, see Get started with Microsoft Flow. When an object is created in Dynamics 365, create a list item in SharePoint. Create Dynamics 365 lead records from an Excel table. Copy Dynamics 365 accounts to customers in Dynamics 365 for Operations. To create a flow from a template, follow these steps. Sign in to the Microsoft Flow website. Click or tap Services, and then click or tap Dynamics 365. Several templates are available. To get started, select the template that you want. If a template isn’t available for what you need, create a flow from scratch. This walkthrough shows you how to create a task in Dynamics 365 whenever a lead is created in Dynamics 365. Click or tap My flows, and then click or tap Create from blank. In the list of flow triggers, click or tap Dynamics 365 - When a record is created. If prompted, sign in to Dynamics 365. Under Organization Name, select the Dynamics 365 instance where you want the flow to listen. Under Entity Name, select the entity that you want to listen to, which will act as a trigger initiating the flow. For this walkthrough, select Leads. Click or tap New step, and then click or tap Add an action. Click or tap Dynamics 365 – Create a new record. 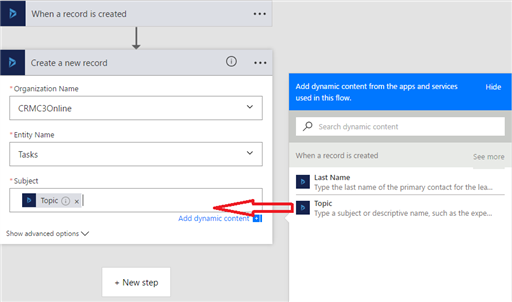 Under Organization Name, select the Dynamics 365 instance where you want the flow to create the record. Notice that it doesn’t have to be the same instance where the event is triggered from. Under Entity Name, select the entity that will create a record when the event occurs. For this walkthrough, select Tasks. A Subject box appears. When you click or tap it, a dynamic content pane appears where you can select either of these fields. Last Name. If you select this field, the last name of the lead will be inserted in the Subject field of the task when it's created. Topic. If you select this field, the Topic field for the lead will be inserted in the Subject field of the task when it's created. For this walkthrough, select Topic. Tip: On the dynamic content pane, click or tap See more to display more fields that are associated with the entity. For example, you can also populate the Subject field of the task with the Company Name, Customer, Description, or Email field of the lead. Click or tap Create flow. This walkthrough shows you how to create a task in Wunderlist whenever a task is created in Dynamics 365. Wunderlist is an Internet-based service that you can use to create to-do lists, add reminders, or track errands. Under Entity Name, select the entity that you want to listen to, which will act as a trigger to initiate the flow. Type create a task, and then click or tap Wunderlist – Create a task. Under List ID, select inbox. Under Title, select Subject in the dynamic content pane. Triggers like When a record is created, When a record is updated, and When a record is deleted initiate your flow within a few minutes of the event occurring. In rare cases, your flow can take up to 2 hours to trigger. When the trigger occurs, the flow receives a notification, but the flow runs on data that exists at the time the action runs. For example, if your flow triggers when a new record is created, and you update the record twice before the flow runs, your flow runs only once with the latest data. When you add a step to a flow, you can click or tap Show advanced options to add a filter or order by query that controls how the data is filtered in the flow. For example, you can use a filter query to retrieve only active contacts, and you can order them by last name. To do this, enter the OData filter query statuscode eq 1 and select Last Name from the dynamic content pane. For more information about filter and order by queries, see MSDN: $filter and MSDN: $orderby. When you add a value to a field, you must match the field type whether you type a value or select one from the dynamic content pane. Expanding on the previous table, here are more examples of fields that don't work with values selected from the dynamic content list. Instead, these fields require both a record ID and lookup type entered into the fields in PowerApps. The Owner field must be a valid user or team record ID. The Owner Type must be either systemusers or teams. The Customer field must be a valid account or contact record ID. The Customer Type must be either accounts or contacts. The Regarding field must be a valid record ID, such as an account or contact record ID. The Regarding Type must be the lookup type for the record, such as accounts or contacts. This example adds an account record that corresponds to the record ID, adding it to the Regarding field of the task. This example also assigns the task to a specific user based on the user's record ID. To find a record's ID, see Find the record ID later in this topic. Important: Fields shouldn't contain a value if they have a description of "For internal use only." These fields include Traversed path, Additional Parameters, and Time Zone Rule Version Number. In the Dynamics 365 web application, open a record, such as an account record. On the actions toolbar, click or tap Pop Out (or click or tap EMAIL A LINK to copy the full URL to your default email program). In the address bar of the web browser, the URL contains the record ID between the %7b and %7d encoding characters.